Want to connect with Roger? NEW GENERATION CONSTRUCTION & ROOFING. We offer professional expertise of a certified specialist. 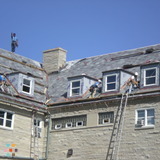 We have 15 years of experience in roofing systems and roofing evaluations..... offer the most experienced workers. We also promise that when it comes with the evaluation of your roofing we are going to be honest and not try to sell you off on buying a whole new roof. We do from the smallest to the biggest repair jobs when it comes to our clients needs. Some of our jobs include the Knox County Court House in Vincennes, IN , IUPUI college dorms in Bloomington, IN. We do residential and commercial jobs, also out of state jobs. Call us TODAY to make your appointment 317-331-..., our contractors speak English and Spanish.